EISA Awards er en bransjepris som femti europeiske fagblader står bak, men som ofte synes å fordele prisene litt vel demokratisk. Valget av European Nikon D3x som Professional Camera 2009-2010 er det nok få som stiller spørsmål ved, men andre valg er det nok mer delte meninger om. Olympus fikk prisen som "Årets kamera" for E-P1. EISA har i år 16 kategorier innen foto. En ny og spennende klasse er "multimediakamera", som ble vunnet av Panasonic GH1. Nikon D3x with its ultra-high 24.4 million-pixel resolution and full frame imaging sensor, the Nikon D3X is a dream for the professional photographer who mixes studio assignments with fast moving dynamic subjects outdoors. The D3X is capable of an image quality that previously could only be achieved with medium format cameras fitted with digital backs, but it has much faster autofocus, continuous shooting rates plus it can be used at sensitivities of up to ISO 6400 with astonishingly good results. With an enormous range of features the D3X is a top-class modern pro-camera that offers total control over the image, from the moment of composition in the large viewfinder to the output of a ready-to-use digital file. The Canon EOS 5D Mark II is a worthy successor of the EOS 5D. The principle features remain the same: a full-frame sensor in a relatively compact body, but Canon has added extra professional features such as sealing against the ingress of dust and moisture and functions like Live View, sensor cleaning and a 1080p HD-movie mode. Despite the increased resolution of 21 million pixels, Canon has been able to reduce noise levels to below those of the 5D, which is a great achievement. The Olympus PEN E-P1 is an elegant camera with an appealing retro design. The camera utilises the new mirror- and prism-less Micro Four Thirds system, which allows the E-P1 to be very compact and lightweight. Besides the compact Micro Four Thirds lenses, users can fit existing Four Thirds, OM and Leica M mount lenses to the body via an adaptor. As the sensor is larger than that found in compact cameras better image quality and lower noise levels can be achieved. The camera doesn’t have a viewfinder but the LCD provides a clear view even in bright conditions. The Canon EOS 500D is an excellent DSLR for both novices and advanced amateur photographers alike. The camera provides extra versatility via its good Live View system, and the large and high resolution LCD monitor. The camera’s image quality is excellent and noise is well controlled even at high ISO settings. The quality of the HD video mode is so impressive that it might provoke the beginning of a new movie-making hobby for some users. The Panasonic Lumix DMC-GH1 combines the advantages of a compact camera with those of a DSLR: it is lightweight, has a small body, a high resolution electronic viewfinder and Live View. In addition, the DMC-GH1 operates quickly, it produces excellent image quality and the lenses are interchangeable. The camera also has a very versatile vari-angle display screen and allows video recording in full HD. Image quality in both still and moving images is stunning. The GH1 is the first system-camera that provides continuous auto-focusing in a movie mode. The Olympus µTough-8000 is the ideal companion for photographers with an active outdoor life. Designed to be used both underwater and for normal photography, the µTough-8000 is waterproof down to 10 meters and even has a built-in pressure gauge that indicates its actual depth. The camera is shock-proof against drops onto hard surfaces from a height of up to 2 meters, and those who enjoy winter sports will find they can use the camera in temperature of minus 10. Many functions can be controlled by tapping the camera’s sides, making it easy to use even when wearing gloves. The Sony Cyber-shot DSC-WX1 is a very compact camera that is equipped with a high quality f/2.4-5.9 'G-lens' with a useful zoom range of 24-120mm. It features an Exmor R CMOS sensor that yields excellent image quality while maintaining low noise levels. At the highest resolution of 10 million pixels, the camera can make a series of 10 images per second. Thanks to the extraordinary Sweep Panorama function, you only have to move the camera across a scene to make excellent panoramics that will be stitched together in-camera. Sony’s new Twilight mode combines multiple exposures to produce hand-held low light images with very little noise. The Casio Exilim EX-H10 is a flat camera that is equipped with an excellent 10x zoom lens that includes a 24mm wide angle. The camera features many creative functions and an HD-ready quality movie mode. The larger than average 3in rear display is perfectly useable even in direct bright sunlight. With a fully-loaded battery the camera can shoot 1000 photos - approximately three times as many as other cameras. The Samsung WB 1000 is an advanced compact camera that features an elegant titanium body and a pair of analogue dials on the top plate that display battery-life and memory capacity information. The Schneider-Kreuznach 5x optical zoom, that has a 24mm widest focal length, has very well controlled distortion, while the 12.2-million-pixel CCD and SLR-like exposure modes help users to shoot creative pictures. Still and MPEG4 HD moving images can be reviewed on the camera’s 3in high-quality AMOLED 460,000-dot screen. These features, together with the built-in optical and software-based stabilisation, ensure that high quality images are easy to achieve. Sigma’s F2.8/24-70mm IF EX DG HSM lens offers first rate image quality in a lightweight and affordable body. Designed for use with full frame and APS-C sensor digital SLRs, as well as 35mm film cameras, this fixed aperture zoom exhibits consistently high detail resolution at all focal lengths and performs well right across the image frame – essential in a full frame lens. The Hypersonic Motor (HSM) boosts the camera’s own autofocusing system, to ensure fast reactions and that subjects are focused and tracked quickly, while high refractive index glasses in three elements allow a compact design and well controlled chromatic aberrations, even at the corners of the frame. Covering an extremely useful range of focal lengths, the Sigma 24-70mm f/2.8 IF EX DG HSM is an excellent lens for the professional and high end amateur alike. With this 15x-zoom APS-C format lens Tamron has not only produced a DSLR lens with the most extensive zoom range available, but also an impressive optical performance. Tamron’s built-in optical image stabilizer, Vibration Compensation (VC), is able to reduce the impact of camera shake so the photographer can hand hold the lens at shutter speeds of up to 4 stops beyond normal safe levels. This is especially useful in low light conditions. With its compact design, light weight, high optical performance and extremely wide focal range the Tamron AF18-270mm VC lens is a perfect travel companion. This new lens from Sony benefits from a solid construction and ED glass elements to achieve the respected G-type quality level expected of professional lenses. It is one of the lightest lenses in its category, and it features a fast and almost silent SSM motor that allows users to switch instantly between auto and manual focus. Image quality is very good even at full aperture, and the lens displays very low distortion for a zoom of such a wide range. This entirely Sony-designed lens is one of the most positive signs of the commitment this manufacturer has towards the pro-level photo equipment of the future. With the revolutionary QuadroPod Novoflex has made a step in to a completely new dimension. The ingenious addition of a fourth leg to the classic tripod delivers enhanced stability as well as a new level of flexibility that enables photographers to shoot with ease from a wide range of positions. The modular concept of the QuadroPod has three different basic elements including tripod legs in various lengths and materials, heads and centre-columns for particular uses and an extensive range of accessories to meet the needs of a wide range of photographers. CeWe Photobook offers beautiful photo books of excellent quality. From small pocket sized items to large square photo books CeWe provides a range of finishes and designs using a choice of papers, including real photo paper in most countries. The downloadable software is available for both PC and MAC and offers an intuitive and easy introduction to putting your own photo book together. There are a range of controls that allow the photographer to select image positioning and page layout manually, but there is also the option to use the program’s assistant mode that will handle almost everything automatically. As the quality of digital cameras accelerates in detail and colour reproduction so the demands on desktop printers increases. Photographers need improved accuracy, speed and convenience, and Canon’s PIXMA Pro9000 Mark II A3+ inkjet printer delivers all three. With 48-bit processing this updated model is able to reproduce a much wider range of colours, and allows photographers to print raw files directly from Canon’s DPP raw conversion software package. A minimum ink droplet size of 2pl ensures even the finest detail is rendered accurately, while providing the potential to produce much smoother tonal and colour transitions. Fujifilm’s new Super CCD EXR sensor has been designed to adjust its behaviour according to the conditions in which it is being used so it can deliver the user the best quality for any situation. The sensor has three different shooting modes that can be either selected manually by the user or left to the camera to automatically choose which suits the occasion. In high resolution (HR) mode the sensor uses all its 12 million pixels to render the finest details of the scene, while a high sensitivity (SN) mode it uses pixel-coupling technology to produce images with low noise levels in very low light conditions. A further high dynamic range (DR) mode combines two exposures to deal with high contrast situations. Samsung har avduket en ny modell kalt 360 Round. Dette kameraet har 17 linser, der åtte er plassert parvis og horisontalt og en vertikalt. Spesifikasjonene er litt skuffende, egentlig, men kameraet klarer sanntidsstrømming og opptak i stereoskopisk 3D med en oppløsning på opptil 4096 x 2048 piksler per øye. Ikke ille, men grisebillige Galaxy 360 leverer samme videostørrelse. Det hadde vært lov å håpe på 8K når Samsung tar skrittet videre. 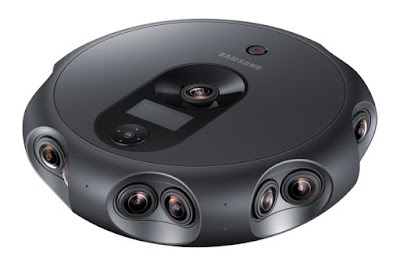 Ifølge Samsung har 360 Round en spesiell utforming som reduserer varme, noe som gjør vifter unødvendige, samtidig som det hele kan holdes i et kompakt design. Solid skal det også være, med IP65-sertifisering. Kameraet veier knappe to kilo, så direkte portabelt er det ikke. Spørsmålet blir dermed: hvor viktig er 3D og hvor mye bedre er bildene sammenlignet med Samsungs nåværende modeller. 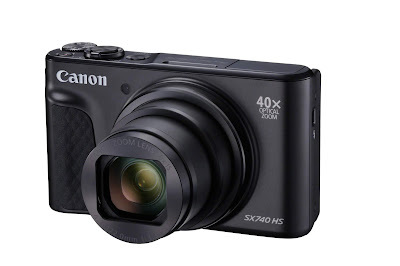 Canon lanserer et av markedets mest kompakte reisekameraer med hele 40x optisk zoom (24–960 mm), PowerShot SX740 HS, som gjør det enklere for ferierende å komme tettere på severdighetene uten å måtte ha med seg flere objektiver. Det nye reisekameraet i lommeformat kan også skilte med videoopptak i 4K Ultra HD-oppløsning, Wi-Fi og Bluetooth®-tilkobling til smarttelefoner og en rekke intuitive, automatiske innstillinger som er perfekt for familier og feriereisende som vil ha et praktisk pek-og-knips-kamera. Det avanserte, kompakte superzoom-kameraet har ZoomPlus-teknologi som øker kameraets 40x optisk zoom digitalt til 80x. Den kraftige kombinasjonen av Canons nyeste DIGIC 8-prosessor og CMOS-sensor gjør det enkelt å få skarpe, fargerike bilder og videoer i høy oppløsning på både kort og lang avstand i alle slags lysforhold. Doug Johnson har laget fem episoder om de grunnelggende tingene man bør beherske som fotograf.